Getting married? Then there is lots to do! If you haven’t started thinking about your wedding invitations here is everything you’ll want from bridal shower invites to thank you cards. Check out this list and then head over to Basic Invite to pick up everything you need! Basic Invite is a stationery design company known for their gorgeous wedding invitations and personalized stationery. They offer more than 180 custom color choices and so much more! Let the festivities begin! Bridal showers serve as the kick off to all your wedding celebrations. It’s a milestone in itself and a total must for brides! There are so many cute ways to celebrate your bridal shower. A tea party in the garden, a black tie brunch, a bohemian dinner party – the options are endless. And at Basic Invite there is a style for every occasion! Once you’ve picked a date and hopefully locked down a venue send out your save the dates. This is such an important step for your guests so they have ample time to prepare and plan. Picking a postcard design is a cute way to inform your guests of the big day to come. Save the date magnets are to die for and not to mention useful! Uploading one of your favorite photos from your engagement shoot or adding a cute initial decor name design along with the date is all you need! Custom making wedding invitations online is the way to go these days. Rather than picking up the same generic set of wedding invitations from your local box store or spending a fortune on handmade boutique invites, custom making invitations online is an affordable method to create one of a kind invites. With over 200 wedding invitation designs at Basic Invite you have so many options to choose from. Whether your style is vintage, modern, traditional, romantic, floral, or art deco there is a design for you. And with more than 100 font choices, 5 paper types, 4 card cuts, and endless customization options you will be able to create the exact invitation you’ve been envisioning. Another creative way to use your engagement photos is by uploading them to a photo wedding invite. Adding a photo as the backdrop to your invitation will add a nice personal touch that your guests will adore. 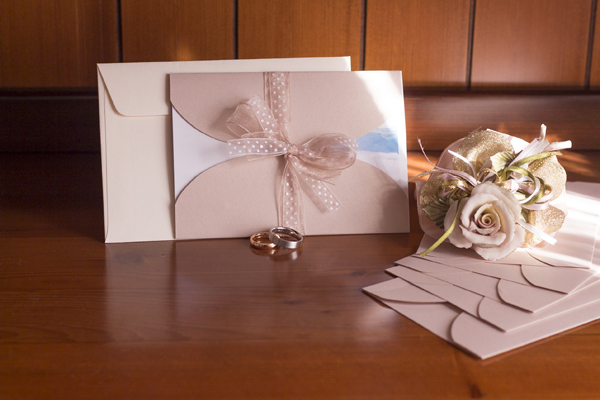 Enclosure cards are an important piece of the wedding stationery package. When creating an entire wedding suite with Basic Invite you can include up to 5 enclosure cards to be housed next to the invitation and placed nicely in a pocket envelope. Enclosure cards are important because they give your guests all the information they need and will serve as a way to make sure the day goes off without a hitch. Each wedding and couple are different and you may not need to include every enclosure card and that is just fine! RSVP cards are the most important. You can include information like time, place, and date on your invite, but RSVP cards will help you with your headcount which is vital to the rest of your wedding plans. These give you the opportunity to get a final headcount as well as dinner requests so you can finalize plans with various vendors. These are all options you can include in your wedding suite in order to prepare guests and give them all the important information in able to plan accordingly. Day of stationery is often overlooked, but it really does help with the flow of the day. Not to mention at Basic Invite you can customize everything to match your original invitations or your wedding decor which can totally round out all of your stationery and add to the aesthetic of place settings too. Guest books are sometimes replaced with creative alternatives like signing something that goes along with the wedding theme, but when you have the option to customize a lay-flat wedding guest book you should go for it! You can choose a matching design to your wedding invites or choose an entirely fresh look with Basic Invite! And is can serve as a keepsake. Hand out wedding programs to your guests as they enter the ceremony so they can get an idea of what the day has in store. This will help the day go smoothly for everyone. The ultimate detail for wedding day table decor. These will make your guests feel special and will create a classy ambiance for your reception. Jazz up your invites and envelopes with stationery accessories. Belly bands are an adorable accessory to any pocket envelope. Choose a complimenting color that will accent your envelope for an adorable touch. Small details like envelope liners serve as the perfect addition to spice up a more simple design. For those who are unable to attend your special day wedding announcements are a nice way to include the loved ones who couldn’t attend. Basic Invite has tons of designs and you can even use a favorite wedding photo as your backdrop or send a holiday themed announcement in place of your annual Christmas card. Whatever the occasion thank you cards are so important. Stock up on thank you cards for your engagement party, bridal shower, and wedding. Thanking your guests for their presence, well wishes, and gifts will show them that you care and that you are appreciative of their attendance. Although your wedding may not require all of these stationery pieces picking and choosing what is appropriate and necessary for your day will help you stay on task and get excited for your journey down the isle. Head over to Basic Invite, the custom card company, and check out all of their beautiful products. Customize anything you want, the way you want!